Bayside High comes to Coney Island, Brooklyn on June 24 when the Cyclones host the Tri-City ValleyCats. 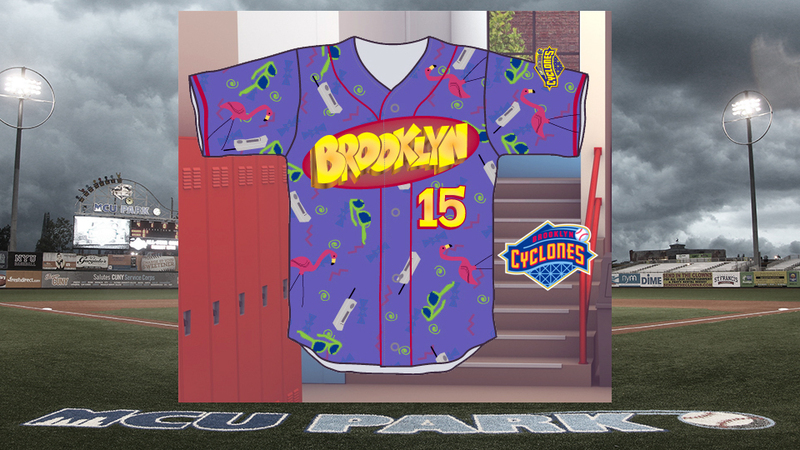 On the evening of Wednesday, June 24, the Brooklyn Cyclones are staging a promotion that will feel like Saturday morning: Saved by the Bell Night at the team's Coney Island home of MCU Park. The Cyclones' wide-ranging tribute to this beloved high school sitcom is highlighted by -- what else? -- a theme jersey. This eye-catching purple-hued uniform top features an array of references to the show, including Zack Morris' cutting-edge cell phone and the fluorescent plastic sunglasses that represented the height of fashion at the time. These jerseys, following standard Minor League Baseball protocol, will be auctioned off throughout the ballgame. Before and during the game, the Cyclones have planned a bevy of Saved by the Bell-inspired games and contests to pay irreverent tribute to the iconic denizens of Bayside High. This includes an "oldest cell phone in the ballpark" competition, backwards musical chairs in honor of the unorthodox sitting methods of heartthrob A.C. Slater, and a chess tournament on the concourse so that fans may channel their inner Screech. After the ballgame, the Cyclones -- Class A Short Season affiliate of the New York Mets -- will allow fans with perms and/or stonewashed jeans to run the bases. Please note, however, that anyone named Johnny Dakota will be denied entrance to the game, as part of the team's long-standing "Say Nope to Dope" policy. The Cyclones' announcement of this 2015 promotional highlight came at a most opportune time. Our nation's nostalgia-driven Saved By the Bell-mania reached its 21st century apex earlier this week, after Jimmy Fallon hosted a cast reunion on The Tonight Show. The Cyclones have not announced that any cast members will be appearing at the ballpark on June 24, though it is worth noting that Dennis "Mr. Belding" Haskins has been a popular celebrity guest throughout the Minor Leagues for the better part of the last decade. Single-game tickets for Saved By the Bell Night are not yet available, but a special Baseball to the MAX package -- named after the popular Bayside High hangout -- is now on sale. The Cyclones' opponent on this evening will be the Tri-City ValleyCats because, as the team notes, "We have to have it the night we play Valley, don't we?" Upon hearing the news of the Cyclones' latest theme night endeavor, fans of the Saved By the Bell are no doubt channeling their inner Jessie Spano: "I'm so excited!"